Arigna Natural Gardens » Keeping Goats. Enid and daughter Bella in playful mood. 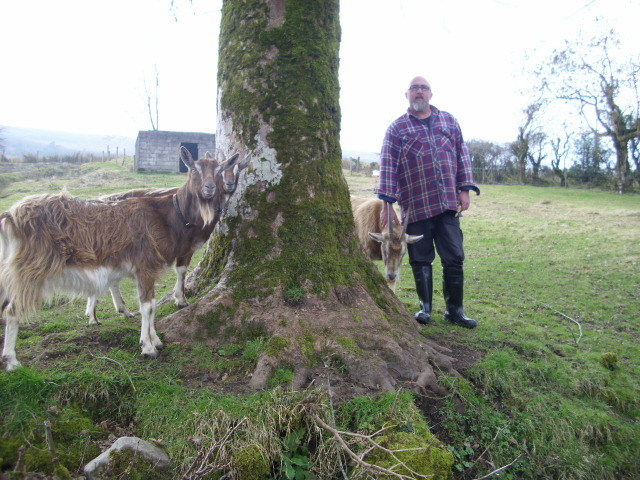 We have kept goats since returning to live in Ireland in 1996. They are such characters, each with their own personality. All animals have their own personalities really but if you are involved in intensive farming you won’t want to see that. You can’t eat your friends! Enid, who provides our daily milk. We are so happy not to be buying milk from the supermarket. Not part of that chain that kills calves after birth to get the Mother’s milk. Not part of that chain that kills Cows when they pass their peak production. Not part of the chain that routinely feeds antibiotics to the animals. Andy with Smokie who is 12 years old. Keeping goats is of course part of our self-sufficiency plan. In return they are well looked after. They have a nice shed with a straw bed, this in turn provides manure for the garden when it rots down. We will never kill them for food, they will be looked after in their old age. Goats of course do need to be well-fenced. They will eat your shrubs, flowers, trees and vegetables. 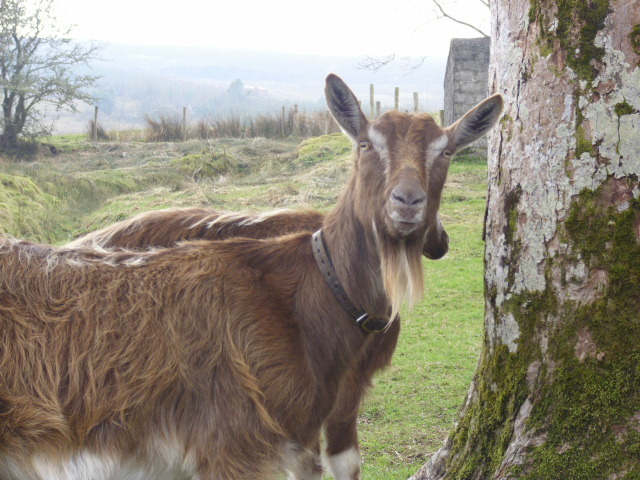 That is the nature of the goat so it’s up to the goatkeeper to keep good fencing, then all will be well. 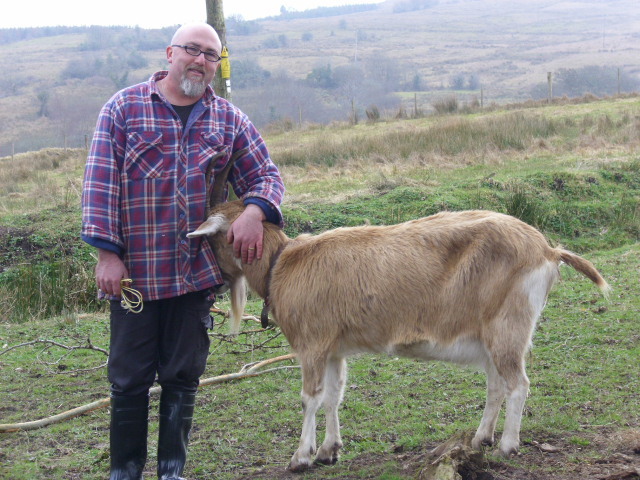 All in all keeping goats has been a good experience for us. Of course there is sadness when animals die, but their life span is shorter than ours so we must cope with that. C’est la vie! 1 comment to Keeping Goats. This is a lovely piece Bridget and so very informative. 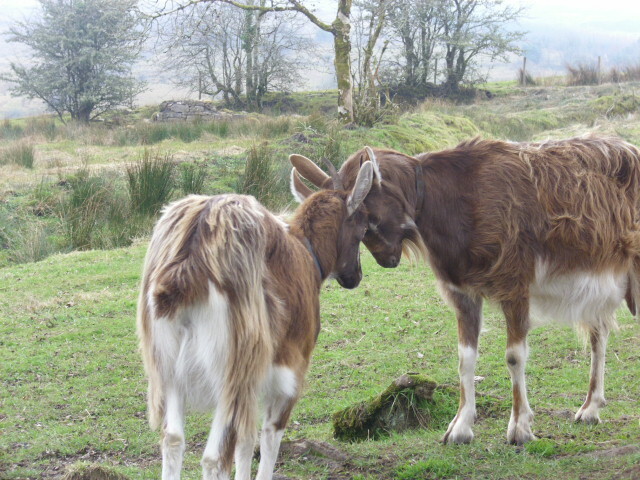 And I can testify to all you say about the goats…they are so very lovely and such teenagers! I often laugh recalling the day I surprised them all! !